Although they’re often designed to remind audiences of what they liked about a previous movie, sequels often have to settle for a less glamorous version of that job description: reminding audiences that what they liked about a previous movie can be difficult to reproduce, even if the movie in question wasn’t a stone-cold classic. Stephen Chow’s Journey To The West: Conquering The Demons is not one of his very best films; it sometimes gets bogged down in its mythology, and its comic snap isn’t as crisp or consistent as The Mermaid, let alone something like Kung Fu Hustle. But its new sequel, Journey To The West: The Demons Strike Back, is an object lesson in the relative specialness of even a second-tier Chow effort. Chow has returned to write and produce this sequel, handing the directing reins over to veteran filmmaker Tsui Hark. Hark approximates the basic tone of the first movie, mixing cartoonish slapstick, whimsical special effects, and spiritual questing, but Chow’s anarchic comedy doesn’t always translate from his screenplay to another director’s camera. If anything, Demons Strike Back is an even zanier and more kid-friendly affair than the Chow original. Yet without Chow’s unique strain of silliness, it also feels louder and more antic while covering less ground. In the previous film, loosely based on classic Chinese literature, Tang was set on a path toward Buddhist enlightenment after floundering as a demon hunter, rising to the occasion, and losing the love of his life. 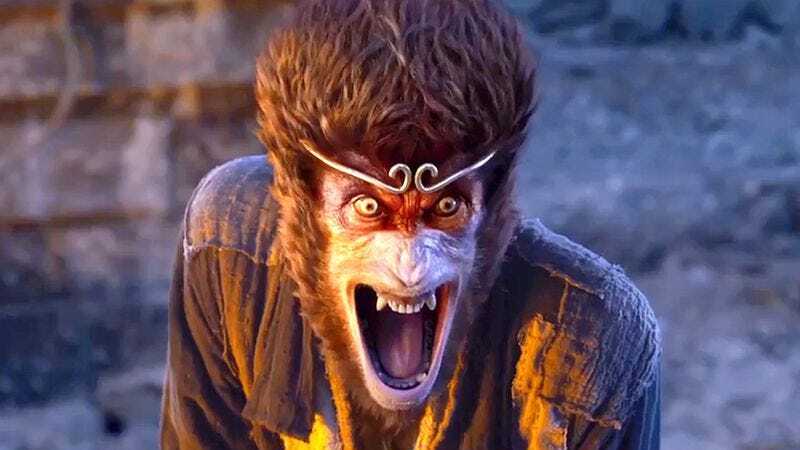 The sequel picks up with Tang (Kris Wu, taking over the role from Wen Zhang) accompanied by three animal-human shapeshifting gods, the Monkey King (Kenny Lin), Pigsy (Yang Yiwei), and fishlike Sandy (Mengke Bateer), now his disciples, which is to say his reluctant sidekicks. (The Monkey King has been just barely tamed since the last movie, but still sometimes yearns to turn against his master.) Tang is on a pilgrimage but still fights demons along the way, during house calls that are somewhere between exorcisms (the animal demons possess human bodies) and ghostbusting (their possessions tend to be colorful and not straight horrific). Most of the demon-detecting seems to happen by accident; the movie has a lot of sequences in which Tang and company stumble across the path of an individual who turns out to be possessed. The playful digressiveness that sometimes characterizes Chow’s films turns a bit aimless here, and on the whole Demons Strike Back feels faker and less populated than its predecessor. Hark films his settings, whether they’re castle interiors or campsites, in a way that doesn’t disguise their origins as constructed sets, which gives it a pageant vibe (or maybe, in its more explosively shiny moments, the feeling of a children’s birthday party). The inorganic (but still frenetic) action does fit well with Hark’s wonderful, confident use of 3-D, which renders even the chintzier effects some visual pop. The movie has some fun with a fluid sense of scale, bookended by scenes where Tang dreams that he is a Gulliver-esque giant in India and a climactic sequence in which one character becomes a gigantic stone version of himself. The movie’s outsized spectacle can’t entirely distract from the footnote-like nature of its story. Demons Strike Back tries to distinguish itself from its predecessor by focusing on the contentious relationship between Tang and the surly, standoffish Monkey King. This would be more of an advantage if the relationship had more depth, rather than positioning the Monkey King as an enslaved, possibly murderous nuisance (Wu’s blandly likable performance as Tang doesn’t help generate much tension, comic or otherwise). The emphasis on the Monkey King also serves to make the movie more of a boys’ club. The previous film had several endearing female characters; here, the absence of Tang’s part-one love interest hangs over the proceedings, and new female lead Felicity (Lin Yun) isn’t introduced until halfway through. She helps facilitate a darker turn about 30 minutes before the end, giving way to a wholesale knockoff of the first movie’s more affecting ending. The English subtitle of Journey To The West: The Demons Strike Back evokes the dark grandeur of the best Star Wars sequel, but the reality of Hark’s film is far more pedestrian. This is a briskly paced, action-packed movie where nothing that happens feels especially urgent. The first film clearly intended to kickstart a grand adventure series. The second, fitfully entertaining as it is, just as clearly indicates that maybe it’s not going to be as easy as it might have looked.